Pianist Orion Weiss is one of the most sought-after soloists and collaborators in his generation of young American musicians. In September 2010, Mr. Weiss was named the Classical Recording Foundation’s Young Artist of the Year. In April 2012, he released Orion Weiss in Concert, a recital album of Dvorak, Prokofiev and Bartok. He is also featured in a recording project of the complete Gershwin works for piano and orchestra with the Buffalo Philharmonic and JoAnn Falletta. A native of Lyndhurst, OH, Weiss attended the Cleveland Institute of Music where he studied with Paul Schenly. 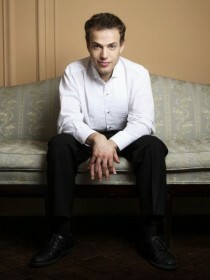 In 2004, he graduated from the Juilliard School, where he studied with Emanuel Ax. He has since performed with numerous orchestras, including the Chicago Symphony Orchestra, the Los Angeles Philharmonic, San Francisco Symphony, Philadelphia Orchestra, Pittsburgh Symphony, and the Toronto Symphony Orchestra. In 2005, he toured Israel with the Israel Philharmonic Orchestra conducted by Itzhak Perlman.